Hydrogen Peroxide: H202 is a common household disinfectant. It is commonly found in almost any home usually stored in a medicine cabinet or with other household cleaners. People typically use hydrogen peroxide for sanitizing small cuts and as a whitener for delicate items. 1. Disinfect counter tops. 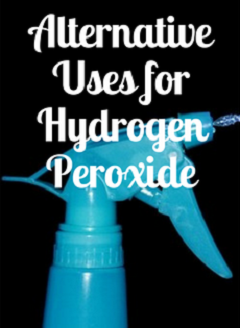 Mix equal parts of hydrogen peroxide and water inside a spray bottle. Spray over counter tops and wipe over with a cloth or sponge. 2. Clean sponges. Sponges are known for harboring funky smells. Mix equal amounts of H202 and warm water in a shallow bowl. Place sponge in the solution and let it soak for about 15 minutes. Then rinse well. 3. Clean a cutting board. First wash cutting board with hot water. Next add equal amounts of H202 and water to a spray bottle and use it to spray over the cutting board. Lastly, follow through with a rinse of pure white vinegar. Dry it and store it in an open area to help prevent the growth of bacteria. 4. Clean the fridge. Take your spray bottle with equal amounts of H202 and water, give surfaces a generous spritz and then wipe over with a clean cloth. 5. Fruit and vegetable rinse. Add a quarter cup of H202 to a large bowl of cold water. Drop fruits or vegetables into the bowl and wash removing any dirt or pesticides. Next, rinse well under plain cold water. 6. Get rid of food residue stuck on pots and pans. Mix some baking soda with a little H202 until forming a paste. Rub the paste over the area with the stuck on food and let sit for at least 10 minutes. Use a sponge and warm water to wipe it off. Baking soda acts as an abrasive while the H202 helps to break up the particles. 7. Add it to the dishwasher. Need an extra germ cleaning boost from your dishwasher? Try adding a few tablespoons of H202 to your dish detergent. 8. Get clean streak-free mirrors. Apply some hydrogen peroxide to a paper towel then wipe down mirrors. 9. Whiten bathtub grout. Once bathtub is fully dry spray thoroughly with H202. Let it sit for at least several minutes. Then scrub the grout with an old toothbrush. This may have to be repeated a few times but worth the effort. 10. Clean toilet bowl. Pour half a cup of H202 into the toilet bowl and let sit for about 20 to 30 minutes depending on the stains. Afterwards, scrub clean with a toilet brush. 11. Remove bathtub grime. Spray H202 on soap grime and let sit for at least 30 minutes. Rinse with water to help loosen the grime making it easier to clean. 12. Remove tough stains from clothes and other fabrics. Mix equal amounts of hydrogen peroxide and dish liquid. Apply this solution directly over the stain and leave it for about 15 to 20 minutes. Then rinse and scrub. Afterward, add to laundry as usual. 13. Whiten clothes. H202 can be used as a general bleach for whites by adding half a cup in the washing cycle. It is a great an alternative to bleach. 14. Brighten floors. Mix half a cup of hydrogen peroxide with one gallon of hot water and wash your floors the same way as you would your regular cleaner. Don't worry the solution is safe for any floor type as it is so mild. You don't even need to rinse it. 15. Clean carpets and rugs. Apply some H202 onto light colored carpets or rugs to remove stains from food, dirt, etc. It is important to test a small inconspicuous area first as H202 will bleach certain types of fabrics. 16. Clean dehumidifiers. Add one cup of H202 to one gallon of water and run the solution through your humidifier to disinfect and remove any mold or mildew that may be inside. 17. Clean toys. Disinfecting wipes are quite expensive. Instead give toys a cleaning with a sprayer filled with equal amounts of H202 and water. It will also be safer for you and your child as it does not contain toxins as is in the commercial disinfecting wipes. 18. Brighten curtains and tablecloths. Over time they can be come stained or develop a yellowish tinge to them. Wipe down these areas with some H202 and leave for a few minutes. Afterward launder as usual. 19. Kill mold. Hydrogen peroxide is effective against many different types of mold and can help clean and detoxify mold from a wide variety of surfaces. Apply H202 directly to any area in your home which has been affected by mold and then wipe it clean. 20. Get rid of dust mites. Although dust mites are almost impossible to get rid of completely they can at least be controlled. Simply spray H202 on bare mattresses to get rid of dust mites. 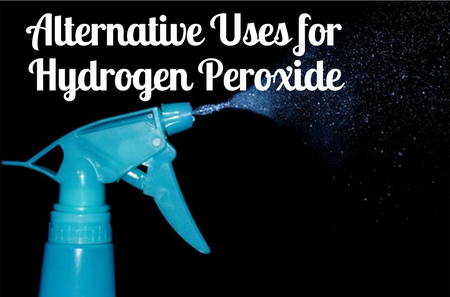 Do you know of any alternative uses for hydrogen peroxide in your home?